The changes in use have caused official interest in .308 self-loading sniper rifles. Here is the DPMS REPR getting a workout. The REPR is a scaled-up AR-15 (which was itself a scaled-down AR-10) but there are parts in common, and accessories galore meant for your 5.56 will fit the 7.62 REPR. The controls and exterior features are all instantly recognizable and familiar to the 5.56 shooter. Well, most. Where the 5.56 has a charging handle on the rear of the upper receiver, the REPR has a charging handle on the left side. It is non-reciprocating, so it won’t move when you shoot. It has a large knob, and if you press in (towards the rifle interior) on the knob, it engages the charging handle, and you can then use it as a forward assist. When you let go, the spring-loaded knob pops back out, ending its short tenure as an assistant. Also, there are extra levers on the exterior. There are two bolts release levers, one on each side, so you can use either hand to press the button. Of course, those accustomed to slapping the left-side lever with their left hand will never notice the one on the right. Which is a shame, as you can use your trigger finger to drop the bolt. Especially when shooting from the bench, I found it a lot easier to just angle my trigger finger up and press the tab, than to press with the left hand, and then have to re-settle the rifle in the bags. With a scope, the LWRCI REPRs deliver the goods a lot more easily. For my testing, I did most of my range work with the 20-inch version and my class work with the 16-inch version. Inside, the 20-inch version has an adjustable Geissele trigger. The other models have either a non-adjustable Geissele, or tuned mil-spec triggers. Geissele has not only designed a fabulous trigger, but they have figured a way for our military to have a match, select-fire trigger. This one, alas, comes semi-only, courtesy the Hughes Amendment to FOPA ’86. Still, the Geissele trigger is clean, crisp, and a joy to use. On the back end is a Magpul PRS, their sniper stock with adjustments for length of pull, comb height and a special rail on the bottom to attach a monopod. The handguard is the LWRCI ARM-R™ forearm, a low-profile free-float tube, with regularly spaced drilled and tapped holes on the bottom and sides. If you want a bit or more of rail in some section, you simply bolt on the length rail you need (rails and screws provided) at the location you need. If you’re handy with tools, you can even measure and cut a longer rail to a shorter length, for just the gear you want on, and no more. It’s not only adaptable and customizable but lighter, too. The smaller-diameter tube that results from not having permanent rails makes the rifle very handy. Had LWRCI not made the forearm this way, the result might well have been something so bulky you’d need NBA-sized hands to grab it. Inside the forearm is a 20-inch heavy contour, cold rotary-forged, Nicorr treated barrel, chambered in 7.62 NATO. The twist is 1:10, and on the end is a .308-sized A2 flash hider. Backing it all up is an LWRCI-upgraded bolt, and what drives it is the LWRCI short-stroke piston system, proportioned for, and beefed up to withstand, .308 power. The LWRCI piston system has a four-position gas adjustment bolt with which you can set the gas for normal, more (adverse conditions), less (using a suppressor), or none (no-cycle suppressor work) at your discretion. The LWRCI REPR comes with a Magpul 7.62 magazine, which is one of the competing “AR-10” magazine designs. Derived from, and compatible with, the original AR-10 and the M-110 rifle currently used in some branches of the armed forces, the Magpul holds 20 rounds of big-bore goodness. More, you ask? Let’s get real. I have 30-round .308/7.62NATO magazines for some other rifles. Trust me, you do not want to be schlepping something that big around, unless you’re feeding something select-fire. Twenty is plenty. However, if you must have more, POF makes a 25-round all-steel magazine that also fits the SR-25 pattern. The LWRCI REPRS, in the three barrel lengths I could obtain. The shortest would be an SBR, and that requires an NFA Tax Stamp. The top rail of the receiver and forearm are co-planar and continuous to the end of the forearm. You can mount lots of gear there, perhaps more than you really should. The REPR comes with folding sights, front and rear, marked with LWRCI and their logo. To test the performance of the 20-inch REPR on drills, I mounted an EOTech EXP on top, zeroed it, and proceeded to thrash some close-range targets with some drills. What I found out pretty quickly is that I couldn’t choke the REPR, and doing fast drills through a lot of big-bore ammo is something you should be in very good shape to do well. It got tiring, even with the big rifle to soak up recoil. So keep that in mind, the next time you feel that a 5.56 is just too “wimpy” and that life would be better with a .308. It will cost you, in ammo, recoil and weapon weight. A brief aside, to those looking at the REPR spec chart on their web page, who will no-doubt snort something to the effect “An M14 weighs two pounds less.” Yes it does. And it has no provision for mounting lights, lasers or scopes in a rational manner. And, it is longer, less accurate, and hardly user-customizable at all. As for accuracy, I grabbed a LaRue 30mm mount and decided to test out a relatively new scope here at Gun Abuse Central, a Famous Maker 4-14X44 with a 30mm tube tactical scope. With a large-diameter tube and mil-dot reticle, it works just fine in daylight. (I haven’t yet had a chance to test it at night, but that will be coming soon.) If my job description included riding in helicopters to places where I’d be kicking down doors, I’m not so sure I’d be depending on a scope that retails for $150. But, as a scope to get started on learning and using mil-dots and for getting a hang for precision or long-range shooting, it will teach you a lot. And I haven’t broken this one yet. Also, to see how it would hold up (as if I had any doubts) I mounted an Insight ATPIAL, a laser targeting designator that is half the size of the older mil-spec laser, the PEQ-2/A. It had no problems with recoil, and I’m not sure I could harm it short of attacking it with a ball-peen hammer. I had a pretty decent selection of .308 ammo to run through the REPR, and I managed to get some impressive accuracy results for my efforts. As with any rifle, I’m sure this one will show preferences for one load over another, but that will take someone with a little more trigger time on precision rifles than I have. As it was, the rifle shoots well enough to make me look like a brilliant rifleman, and as I said earlier, that makes it very attractive. For class use, I hauled the 16-inch barreled one off to one of our patrol rifle classes. It worked as expected, flawlessly, and I continued my passing/perfect qual scores string. It also was easy to dump the 300-meter pop-ups, even with iron sights. You want a semi-auto sniper rifle, this one will do the job, easy. The SIG DMR variant of their 556, introducing itself to the long-range steel. Now, don’t get me wrong. Bolt-action rifles have strengths that can’t be easily discounted. Let’s take, for example, accuracy. We all know what accuracy is, right? All the shots through one hole at absurd distances. Well, partly right. How would you feel about a rifle that put all its shots not just through a ragged group, but through the same hole, time after time? Great, right? What if, each morning, when you pulled it out of the rack, that point of impact was several inches in some random direction? They’ll all go through the same hole, but you don’t know where the hole will be. That is an accurate rifle, but not a repeatable one. Bolt-action rifles, especially ones with free-floated barrels, have not just accuracy, but repeatability. Given the same ammo lot, they will have the same point of impact, day or night, hot or cold, wet or dry. One such rifle that I’ve had a chance to test is the SIG Blaser Tactical 2. It is a bolt-action rifle, plopped into a high-tech polymer stock that free-floats the barrel, and offers cheekpiece, buttplate length of pull and pitch adjustments. If you can’t make this one fit you, you’re harder to fit than an NBA player. And in case you need fast follow-up shots, while it has a bolt handle on the side, you don’t turn and pull, you just pull. It is a straight-pull bolt action, where the bolt head is an expanding collet that locks securely to the barrel extension. As if that weren’t enough, you can have it in four different calibers; .223, .308, .300 Winchester Magnum, and .338 Lapua. Now, at the extreme, with the .338 Lapua and its 27-inch barrel, you have a rifle that starts out at just over 12-1/2 pounds. But, even with the muzzle brake, when you touch off a Lapua round, you’ll be glad it is that heavy. I had an afternoon with one at the SIG plant, and with it I was able (in the .308 version) to shoot a bragging-size target. If you have the opportunity as a team leader (LEO or military) to have a school-trained sniper along with you, you have a very useful asset. However, you won’t. The next-best thing is to get a really accurate rifle into the hands of the best shooter on your squad or platoon and have him do the medium-range sniping for you. In the military, that job description is Squad Designated Marksman. A scope on an M16 or M4 is good, but the military has been building purpose-made rifles for the job. SIG makes their 556 Classic in a DMR configuration. It uses, instead of the 16-inch barrel, a 21-inch tube, and the stock is a Magpul PRS stock. The trigger is an enhanced single-stage trigger, which means it is built to be cleaner than the already nice SIG 556 trigger, and the forearm is instead of the polymer halves, a railed free-float setup. Well, as much as you can free-float a piston-driven barrel. With it, I was able to commit wholesale slaughter among one-liter water bottles at 200 yards, and hitting a LaRue steel plate at 600 was so easy it almost became boring. I say “almost” because once I had figured the drop (a 5.56 round, depending on the load, drops 50 to 60 inches out there) I started doing head-shots only. The rifle was so soft to shoot, and so accurate, that I almost gave in and asked what the special writer’s price would be on one. This article is an excerpt from the Gun Digest Book of the Tactical Rifle. Click here to order your copy. Build up your long range shooting skill-set with the Master the Art of Long Range Shooting Collection, and gather valuable tips and techniques from several expert authors. 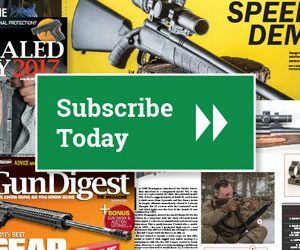 Whether you’re interested in long-range shooting for hunting or competition, discover the gear, tools, and resources you’ll need to make the long shots: Dead On, un Digest Book of Long-Range Shooting, 2nd Edition, ABCs of Rifle Shooting, astering the Art of Long-Range Shooting, Sniper Shooting Basics, The Technical Rifleman, Gun Digest the Magazine, March 27, 2014.